Computer-generated map of Pluto from Hubble images, synthesized true color and among the highest resolutions possible with current technology. Pluto, also designated (134340) Pluto or 134340 Pluto, is the second-largest known dwarf planet in the solar system and the tenth largest observed body directly orbiting the Sun. It orbits between 29 and 49 AU from the Sun, and was the first Kuiper Belt object to be discovered. Approximately one-fifth the mass of the Earth's Moon, Pluto is composed primarily of rock and ice. It has an eccentric orbit that is highly inclined with respect to the planets and takes it closer to the Sun than Neptune during a portion of its orbit. Pluto and its largest satellite, Charon, could be considered a binary system because they are closer in size than any of the other known celestial pair combinations in the solar system, and because the barycenter of their orbits does not lie within either body. However, the International Astronomical Union (IAU) has yet to formalize a definition for binary dwarf planets, so Charon is currently regarded as a moon of Pluto. Two smaller moons, Nix and Hydra, were discovered in 2005. An additional two small moon, informally called P4 and P5, were discovered in 2011 and 2012 respectively. Pluto is smaller than several of the natural satellites or moons in our solar system. From its discovery by Clyde Tombaugh in 1930, Pluto was considered the solar system's ninth planet. In the late twentieth and early twenty-first century, many similar objects were discovered in the outer solar system, most notably the trans-Neptunian object Eris, which is slightly larger than Pluto. On August 24, 2006, the IAU defined the term "planet" for the first time. This definition excluded Pluto, which was then reclassified under the new category of dwarf planet along with Eris and Ceres. Pluto is also classified as the prototype of a family of trans-Neptunian objects. After the reclassification, Pluto was added to the list of minor planets and given the number 134340. In 1930 Clyde Tombaugh was working on a project searching for a ninth planet at Lowell Observatory. Tombaugh's work was to systematically take pictures of the celestial sky in pairs, one to two weeks apart, then look for objects that had moved between images. On February 18, 1930, Tombaugh discovered a possible moving object on photographic plates taken on January 23 and January 29 of that year. A lesser-quality photo taken on January 20 helped confirm the movement. After the observatory worked to obtain further confirmatory photographs, news of the discovery was telegraphed to the Harvard College Observatory on March 13, 1930. Pluto would later be found on photographs dating back to March 19, 1915. The history of how Pluto was discovered is intertwined with the discoveries of Neptune and Uranus. In the 1840s, using Newtonian mechanics, Urbain Le Verrier, and John Couch Adams had correctly predicted the position of the then-undiscovered planet Neptune after analyzing perturbations in the orbit of Uranus. Theorizing the perturbations were caused by the gravitational pull of another planet, Johann Gottfried Galle discovered Neptune on September 23, 1846. Observations of Neptune in the late nineteenth century had astronomers starting to speculate that Neptune's orbit too was also being disturbed by another planet in a similar manner that Neptune was disturbing Uranus. By 1909 William H. Pickering and Percival Lowell had suggested several possible celestial coordinates for such a planet. In May 1911, the Bulletin of the Astronomical Society of France published calculations by Indian astronomer V.B. Ketakar, who predicted a location for an undiscovered planet. Percival Lowell had significant influence on Pluto's discovery. In 1905, Lowell Observatory (founded by Lowell in 1894) started an extensive project in search of a possible ninth planet. The work continued after Lowell's death in 1916. Lowell was searching for a theoretical Planet X to match observations seen in Uranus and Neptune. Pluto is too small to have the effect on Neptune's orbit that initiated the search. After the flyby of Neptune by Voyager 2 in 1989, it was conclusively demonstrated that the discrepancies in Neptune's orbit observed by nineteenth century astronomers were due instead to inaccurate estimates of Neptune's mass. Once found, Pluto's faintness and lack of a visible disk cast doubt on the idea that it could be Percival Lowell's Planet X. Lowell had made a prediction of Pluto's position in 1915 which was fairly close to its actual position at that time; however, Ernest W. Brown concluded almost immediately that this was a coincidence, and this view is still held today. Tombaugh's discovery is therefore even more surprising, given that Pluto's proximity to the region predicted by Pickering, Lowell, and Ketakar was likely a mere coincidence. The right to name the new object belonged to the Lowell Observatory and its director, Vesto Melvin Slipher. Tombaugh urged Slipher to suggest a name quickly for the new object before someone else did. Name suggestions poured in from all over the world. Constance Lowell, Percival Lowell's widow, proposed Zeus, then Lowell, and finally her own first name, none of which met with any enthusiasm. Mythological names, such as Cronus and Minerva, were high on a list of considered names. It was officially named on March 24, 1930. The name Pluto was first suggested by Venetia Burney (later Venetia Phair), an 11-year-old girl from Oxford, England. Venetia, who was interested in classical mythology as well as astronomy, suggested the name, the Roman equivalent of Hades, in a conversation to her grandfather Falconer Madan, a former librarian of Oxford University's Bodleian Library. Madan passed the suggestion to Professor Herbert Hall Turner, Turner then cabled the suggestion to colleagues in America. After favorable consideration which was almost unanimous, the name Pluto was officially adopted and an announcement made on May 1, 1930. Upon the announcement, Madan gave Venetia five pounds as a reward. The name that was retained for the object is that of the Roman god Pluto, and it is also intended to evoke the initials of the astronomer Percival Lowell. In the Chinese, Japanese, and Korean languages, the name was translated as “underworld king star,” suggested by Houei Nojiri in 1930. In Vietnamese it is named after Yama, the guardian of hell in Buddhist mythology. Yama is also used in India, as it is the deity of hell in Hindu mythologies. Pluto's astronomical symbol is a P-L monogram, ( ). This represents both the first two letters of the name Pluto and the initials of Percival Lowell, who had searched extensively for a ninth planet and who had founded Lowell Observatory, the observatory from which Tombaugh discovered Pluto. Besides its astronomical symbol Pluto also has an astrological symbol. Pluto's astrological symbol resembles that of Neptune ( ), but has a circle in place of the middle prong of the trident ( ). 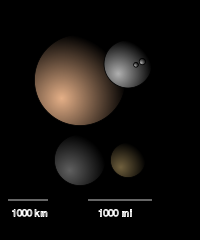 Diagram of Pluto (top left) and its moons (top right) compared in size, albedo and color index with the largest plutinos: Orcus (bottom left) and Ixion (bottom right). Many details about Pluto remain unknown, mainly due to the fact that it has not yet been visited up close by spacecraft. Pluto's distance from Earth makes in-depth investigation difficult. Pluto's apparent magnitude is fainter than 14 m and therefore a telescope is required for observation. To see it, a telescope of around 30 centimeter aperture is desirable. It looks star-like even in very large telescopes because its angular diameter is only 0.15." The color of Pluto is light brown with a very slight tint of yellow. Charon's discovery resulted in the calculation of Pluto's albedo (a measure of brightness) being revised upward; since Pluto was now seen as being far smaller than originally estimated, its capacity to reflect light must be greater than formerly believed. Current estimates place Pluto's albedo as marginally less than that of Venus, which is fairly high. Distance and limits on telescope technology make it currently impossible to directly photograph surface details on Pluto. Images from the Hubble Space Telescope barely show any distinguishable surface definitions or markings. The best images of Pluto derive from brightness maps created from close observations of eclipses by its largest moon, Charon. Using computer processing, observations are made in brightness factors as Pluto is eclipsed by Charon. For example, eclipsing a bright spot on Pluto makes a bigger total brightness change than eclipsing a gray spot. Using this technique, one can measure the total average brightness of the Pluto-Charon system and track changes in brightness over time. Pluto's volume is about 0.66 percent that of Earth's. Pluto's diameter and mass were incorrectly overestimated for many decades after its discovery. Initially it was thought to be relatively large, with a mass comparable to Earth, but over time the estimates were revised sharply downward as observations were refined. The discovery of its satellite Charon in 1978 enabled a determination of the mass of the Pluto-Charon system by application of Newton's formulation of Kepler's third law. Assuming a single object is being observed, Pluto appears to have a mass roughly between Mercury and Mars, but once it was realized that there were in fact two celestial bodies, the estimated size of Pluto was reduced. Observations were able to determine Pluto's diameter when it is at occultation with Charon, and its shape can be resolved by telescopes using adaptive optics. Pluto's diameter is 2,390 kilometers, which makes it the largest known object in the main Kuiper Belt. 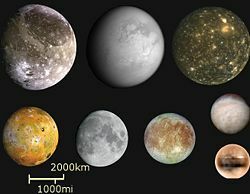 Pluto (bottom right) compared in size to the largest satellites in the solar system (from left to right and top to bottom): Ganymede, Titan, Callisto, Io, the Moon, Europa, and Triton. Among the objects of the solar system, Pluto is not only smaller and much less massive than any planet, but at less than 0.2 lunar masses it is also smaller and less massive than seven of the moons: Ganymede, Titan, Callisto, Io, the Moon, Europa and Triton. Pluto is more than twice the diameter and a dozen times the mass of Ceres, a dwarf planet in the asteroid belt. However, it is smaller than the scattered-disc object Eris, discovered in 2005. Pluto does not have a significant atmosphere. It has a thin envelope of gas that is most likely made up of nitrogen, methane, and carbon monoxide, that develops in equilibrium with solid nitrogen and carbon monoxide ices on the surface as it approaches the Sun. As Pluto moves away from its perihelion (closest point to the Sun), more of its atmosphere freezes and falls to the ground. When it returns to a closer proximity to the Sun, the temperature of Pluto's solid surface will increase, causing the nitrogen ice to sublimate into gas—creating an anti-greenhouse effect. Much as sweat evaporating from the surface of human skin, this sublimation has a cooling effect and scientists have recently discovered, by use of the submillimeter array, that Pluto's temperature is 10 K less than they expected. Pluto was found to have an atmosphere from an occultation observation in 1985 (IAU Circ. 4097; MNRAS 276: 571); the finding was confirmed and significantly strengthened by extensive observations of another occultation in 1988. When an object with no atmosphere occults a star, the star abruptly disappears; in the case of Pluto, the star dimmed out gradually. From the rate of dimming, the atmosphere was determined to have a pressure of 0.15 Pa, roughly 1/700,000 that of Earth. In 2002 another occultation of a star by Pluto was observed and analyzed by teams led by Bruno Sicardy of the Paris Observatory. and by James Elliot of MIT and Jay Pasachoff of Williams College. Surprisingly, the atmosphere was estimated to have a pressure of 0.3 Pa, even though Pluto was further from the Sun than in 1988, and hence should be colder and have a less dense atmosphere. The current best hypothesis is that the south pole of Pluto came out of shadow for the first time in 120 years in 1987, and extra nitrogen sublimated from a polar cap. It will take decades for the excess nitrogen to condense out of the atmosphere. In October 2006, the spectroscopic discovery of ethane (C2H6) on Pluto's surface, presented by Dale Cruikshank of NASA/Ames Research Center (a New Horizons co-investigator) and colleagues was announced. This ethane is produced from the photolysis or radiolysis (i.e., the chemical conversion driven by sunlight and charged particles) of frozen methane (CH4) on Pluto's surface and suspended in its atmosphere. The MIT-Williams College team of James Elliot and Jay Pasachoff and a Southwest Research Institute team led by Leslie Young observed a further occultation of a star by Pluto on June 12, 2006, from sites in Australia. The surface of Pluto is remarkably heterogeneous, as evidenced by its lightcurve, maps of its surface constructed from Hubble Space Telescope observations, and periodic variations in its infrared spectra. The face of Pluto oriented toward Charon contains more methane ice, while the opposite face contains more nitrogen and carbon monoxide ice. This makes Pluto the second most contrasted body in the Solar System after Iapetus. Orbit of Pluto – ecliptic view. This 'side view' of Pluto's orbit (in red) shows how steeply inclined the orbit is in comparison to Neptune's orbit which orbits closer to ecliptic (in blue). Pluto's orbit is very unusual in comparison to the planets of the solar system. The planets orbit the Sun close to an imaginary flat plane called the plane of the ecliptic, and have nearly circular orbits. In contrast, Pluto's orbit is highly inclined above the ecliptic (up to 17° above it) and very eccentric (non-circular). Owing to the orbit’s inclination, Pluto's perihelion is well above (~8.0 AU) the ecliptic. The high eccentricity means that part of Pluto's orbit is closer to the Sun than Neptune's. Orbit of Pluto – polar view. This 'view from above' shows how Pluto's orbit (in red) is less circular than Neptune's (in blue), and also shows how Pluto is sometimes closer to the Sun than Neptune. The darker halves of both orbits show where they pass below the plane of the ecliptic. The positions of both are marked as of April 16, 2006. Over the course of one year, they change by about one pixel. Near perihelion, Pluto gets closer to the Sun than Neptune; the most recent occurrence of this phenomenon lasted from February 7, 1979 through February 11, 1999. Mathematical calculations indicate that the previous occurrence lasted only fourteen years from July 11, 1735 to September 15, 1749. However, the same calculations indicate that Pluto was closer to the Sun than Neptune between April 30, 1483 and July 23, 1503, which is almost exactly the same length as the 1979 to 1999 period. Recent studies suggest each crossing of Pluto to inside Neptune's orbit lasts alternately for approximately thirteen and twenty years with minor variations. 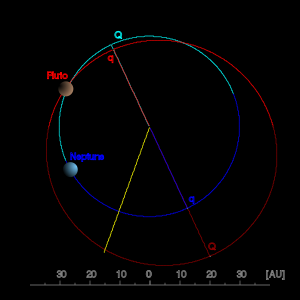 Pluto orbits in a 3:2 orbital resonance with Neptune. When Neptune approaches Pluto from behind their gravity starts to pull on each other slightly, resulting in an interaction between their positions in orbit of the same sort that produces Trojan points. Since the orbits are eccentric, the 3:2 periodic ratio is favored because this means Neptune always passes Pluto when they are almost farthest apart. Half a Pluto orbit later, when Pluto is nearing its closest approach, it initially seems as if Neptune is about to catch up with Pluto. But Pluto speeds up due to the gravitational acceleration from the Sun, stays ahead of Neptune, and pulls ahead until they meet again on the other side of Pluto's orbit. Pluto is also affected by the Kozai mechanism, which causes its closest approach to the Sun to occur when it is farthest out of the plane of the solar system, again keeping Pluto from getting too close to Neptune. 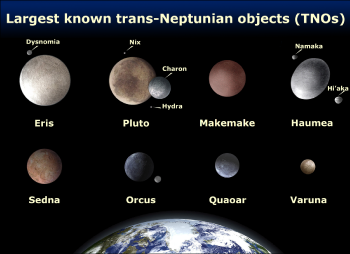 Beginning in the 1990s, other trans-Neptunian objects (TNOs) were discovered, and a certain number of these also have a 3:2 orbital resonance with Neptune. TNOs with this orbital resonance are named "plutinos" after Pluto. 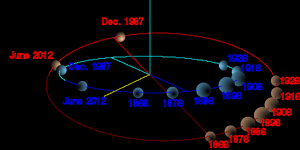 This diagram shows the relative positions of Pluto (red) and Neptune (blue) on selected dates. The size of Neptune and Pluto is depicted as inversely proportional to the distance to facilitate comparison. The closest approach is in 1896. Pluto's orbit is often described as 'crossing' that of Neptune. In fact, Pluto's nodes (the points at which the orbit crosses the ecliptic) are both situated outside Neptune’s orbit and are separated by a distance of 6.4 AU (that is, over six times the distance of the Earth from the Sun). Furthermore, due to the orbital resonance between them, Pluto executes 2 full cycles while Neptune makes 3; this means that when Neptune reaches the 'closest' point on the orbit, Pluto remains far behind and when Pluto in turn reaches that point, Neptune is far (over 50 degrees) ahead. During the following orbit of Pluto, Neptune is half an orbit away. Consequently, Pluto never gets closer than 30 AU to Neptune at this point in its orbit. 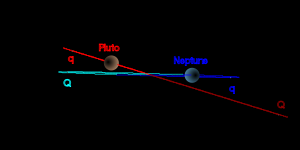 The actual closest approach between Neptune and Pluto occurs at the opposite part of the orbit, some 30 years after Pluto's aphelion (its last aphelion was in 1866) when Neptune catches up with Pluto (i.e., Neptune and Pluto have similar longitudes). The minimum distance was 18.9 AU in June 1896. In other words, Pluto never approaches Neptune much closer than it approaches Saturn. In the 1950s, it was suggested that Pluto was an escaped moon of Neptune, knocked out of orbit by Triton, Neptune's largest moon. This notion has since been discredited. Triton shares many similarities in atmospheric and geologic compositions with Pluto and is believed to be a captured Kuiper belt object. The Kuiper belt is believed to be the source for all short-period comets, and Pluto, like other Kuiper Belt objects, shares features in common with comets. The solar wind is gradually blowing Pluto's surface into space, in the manner of a comet. If Pluto were placed near the Sun, it would develop a tail, like comets do. Pluto has five known natural satellites: Charon, first identified in 1978 by astronomer James Christy; and two smaller moons, Nix and Hydra, both discovered in 2005; S/2011 (134340) 1 (provisional name, also known as P4), identified by the Hubble Space Telescope in 2011, and S/2012 (134340) 1 found in 2012 and referred to as P5. The Pluto-Charon system is noteworthy for being the largest of the solar system's few binary systems, i.e. whose barycenter lies above the primary's surface (617 Patroclus is a smaller example). This and the large size of Charon relative to Pluto lead some astronomers to call it a dwarf double planet. The system is also unusual among planetary systems in that they are both tidally locked to each other: Charon always presents the same face to Pluto, and Pluto also always presents the same face to Charon. Two additional moons of Pluto were imaged by astronomers working with the Hubble Space Telescope on May 15, 2005, and received provisional designations of S/2005 P 1 and S/2005 P 2. 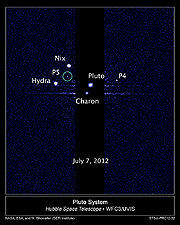 The International Astronomical Union officially christened Pluto's newest moons Nix (or Pluto II, the inner of the two moons, formerly P 2) and Hydra (Pluto III, the outer moon, formerly P 1), on June 21, 2006. These small moons orbit Pluto at approximately two and three times the distance of Charon: Nix at 48,700 kilometers and Hydra at 64,800 ilometersm from the barycenter of the system. They have nearly circular prograde orbits in the same orbital plane as Charon, and are very close to (but not in) 4:1 and 6:1 mean motion orbital resonances with Charon. Observations of Nix and Hydra are ongoing to determine individual characteristics. Hydra is sometimes brighter than Nix, speculating that it either is larger in dimension or different parts of its surface may vary in brightness. Sizes are estimated from albedos. The moons' spectral similarity with Charon suggests a 35 percent albedo similar to Charon's; this results in diameter estimates of 46 kilometers for Nix and 61 kilometers for brighter Hydra. Upper limits on their diameters can be estimated by assuming the 4 percent albedo of the darkest Kuiper Belt objects; these bounds are 137 ± 11 km and 167 ± 10 km, respectively. At the larger end of this range, the inferred masses are less than 0.3 percent of Charon's mass, or 0.03 percent of Pluto's. With the discovery of the two small moons, Pluto may possess a variable ring system. Small body impacts can create debris that can form into a ring system. Data from a deep optical survey by the Advanced Camera for Surveys on the Hubble Space Telescope suggests that no ring system is present. If such a system exists, it is either tenuous like the rings of Jupiter, or it is tightly confined to less than 1000 km in width. Pluto presents significant challenges for space craft because of its small mass and great distance from Earth. Voyager 1 could have visited Pluto, but controllers opted instead for a close flyby of Saturn's moon Titan, which resulted in a trajectory incompatible with a Pluto flyby. Voyager 2 never had a plausible trajectory for reaching Pluto. In 2000 NASA cancelled the Pluto Kuiper Express mission, citing increasing costs and launch vehicle delays. 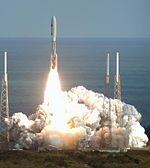 The first spacecraft to visit Pluto will be NASA's New Horizons, launched on January 19, 2006. The craft will benefit from a gravity assist from Jupiter, and the closest approach to Pluto will be on July 14, 2015. Scientific observations of Pluto will begin five months prior to closest approach and will continue for at least a month after the encounter. New Horizons captured its first images of Pluto in late September 2006, during a test of the Long Range Reconnaissance Imager (LORRI). The images, taken from a distance of approximately 4.2 billion kilometers (2.6 billion miles), confirm the spacecraft's ability to track distant targets, critical for maneuvering toward Pluto and other Kuiper belt objects. New Horizons will use a remote sensing package that includes imaging instruments and a radio science investigation tool, as well as spectroscopic and other experiments, to characterize the global geology and morphology of Pluto and its moon Charon, map their surface composition, and characterize Pluto's neutral atmosphere and its escape rate. New Horizons will also photograph the surfaces of Pluto and Charon. Some of the ashes of Pluto's discoverer, Clyde W. Tombaugh, are aboard the spacecraft. Discovery of moons Nix and Hydra may present unforeseen challenges for the probe. With the relatively low escape velocity of Nix and Hydra, collisions with Kuiper Belt debris may produce a tenuous dusty ring. Were New Horizons to fly through such a ring system, there would be an increased potential for micrometeorite damage that could damage or disable the probe. Pluto's official status as a planet has been a constant subject of controversy, fueled by the past lack of a clear definition of planet, since at least as early as 1992, when the first Kuiper Belt Object, (15760) 1992 QB1, was discovered. Since then, further discoveries intensified the debate in the twenty-first century. Museum and planetarium directors occasionally created controversy by omitting Pluto from planetary models of the solar system. Some omissions were intentional; the Hayden Planetarium reopened after renovation in 2000 with a model of eight planets without Pluto. The controversy made headlines in the media at the time. Pluto is shown as a planet on the Pioneer plaque, an inscription on the space probes Pioneer 10 and Pioneer 11, launched in the early 1970s. The plaque, intended to give information about the origin of the probes to any alien civilization that might in the future encounter the vehicles, includes a diagram of our solar system, showing nine planets. Similarly, an analog image contained within the Voyager Golden Record included on the probes Voyager 1 and Voyager 2 (also launched in the 1970s) includes data regarding Pluto and again shows it as the ninth planet. Elements 92, 93, and 94 are named uranium, neptunium, and plutonium, respectively after Uranus, Neptune, and Pluto. The Disney character Pluto, introduced in 1930, was also named in honor of the planet. Continuing advances in telescope technology allowed for further discoveries of Trans-Neptunian objects in the twenty-first century, some of comparable size to that of Pluto. In 2002, 50000 Quaoar was discovered, with a diameter of 1,280 kilometers, about half that of Pluto. In 2004 the discoverers of 90377 Sedna placed an upper limit of 1,800 kilometers on its diameter, near Pluto's diameter of 2,320 kilometers. On July 29, 2005, a Trans-Neptunian object later named Eris was announced, which on the basis of its magnitude and simple albedo considerations is assumed to be slightly larger than Pluto. This was the largest object discovered in the solar system since Neptune in 1846. Discoverers and media initially called it the "tenth planet," although there was no official consensus at the time on whether to call it a planet. Others in the astronomical community considered the discovery to be the strongest argument for reclassifying Pluto as a minor planet. The last remaining distinguishing features of Pluto were now its large moon, Charon, and its atmosphere; these characteristics are probably not unique to Pluto: several other Trans-Neptunian objects have satellites; and Eris' spectrum suggests that it has a similar surface composition to Pluto, as well as a moon, Dysnomia, discovered in September 2005. Trans-Neptunian object (136108) 2003 EL61 (nicknamed "Santa") has two moons (one of which is nicknamed "Rudolph") and is the fourth largest TNO behind Eris, Pluto, and (136472)2005FY9 (nicknamed "Easterbunny"). Pluto fails to meet the third condition. The IAU further resolved that Pluto be classified in the simultaneously created dwarf planet category, and that it act as prototype for a yet-to-be-named category of trans-Neptunian objects, in which it would be separately, but concurrently, classified. There has been resistance amongst the astronomical community towards the reclassification, dubbed the "Great Pluto War" by some astronomers. Alan Stern, principal investigator with NASA's "New Horizons" mission to Pluto, has publicly derided the IAU resolution, stating that "the definition stinks…for technical reasons." Stern's current contention is that by the terms of the new definition Earth, Mars, Jupiter and Neptune, all of which share their orbits with asteroids would be excluded. However, his own published writing has supported the new list of planets, as "our solar system clearly contains" eight planets that have cleared their neighborhoods, however, he does not deny planetary classification to objects like Pluto & Ceres that have not "cleared their neighborhood." Marc W. Buie of the Lowell Observatory has voiced his opinion on the new definition on his website and is one of the petitioners against the definition. Others have supported the IAU. Mike Brown, the astronomer who discovered Eris, said "through this whole crazy circus-like procedure, somehow the right answer was stumbled on. It’s been a long time coming. Science is self-correcting eventually, even when strong emotions are involved." Among the general public, reception is mixed amidst widespread media coverage. Some have accepted the reclassification, while some are seeking to overturn the decision, with online petitions urging the IAU to consider reinstatement. A resolution introduced by some members of the California state assembly light-heartedly denounces the IAU for "scientific heresy," among other crimes. Others reject the change for sentimental reasons, citing that they have always known Pluto as a planet and will continue to do so regardless of the IAU decision. The verb "pluto" (preterite and past participle: "plutoed") was coined in the aftermath of the decision. In January 2007, the American Dialect Society chose "plutoed" as its 2006 Word of the Year, defining to "pluto" as "to demote or devalue someone or something," an example being "as happened to the former planet Pluto when the General Assembly of the International Astronomical Union decided Pluto no longer met its definition of a planet." ↑ Hoyt, William Graves (1976). W. H. Pickering's Planetary Predictions and the Discovery of Pluto. Isis 67 (4): 551–564. ↑ 2.0 2.1 Rao, Joe (March 11, 2005). Finding Pluto: Tough Task, Even 75 Years Later. SPACE.com. Retrieved May 25, 2007. ↑ The Astronomical Society of the Pacific "106th Annual Meeting" History Sessions. Retrieved May 25, 2007. ↑ ”The Trans-Neptunian Body: Decision to call it Pluto.” Times ( May 27, 1930): 15. ↑ 5.0 5.1 Rincon, P. (January 13, 2006). The girl who named a planet. BBC News. Retrieved May 25, 2007. ↑ Claxton, K. M. The Planet 'Pluto'. Parents' Union School Diamond Jubilee Magazine, 1891–1951 (Ambleside: PUS, 1951): 30–32. Retrieved May 25, 2007. ↑ Solar Database: Pluto. Retrieved May 25, 2007. ↑ Than, Ker (2006). Astronomers: Pluto colder than expected. Space.com (via CNN.com). Retrieved May 25, 2007. ↑ Sicardy, Bruno and Thomas Widemann. Drastic expansion of Pluto's atmosphere as revealed by stellar occultations. Observatoire de Paris. Retrieved May 25, 2007. ↑ Pluto is undergoing global warming, researchers find (2002). Retrieved May 25, 2007. ↑ Williams Scientists Contribute to New Finding About Pluto (2002). Retrieved May 25, 2007. ↑ Stern, Alan (November 1, 2006). Making Old Horizons New. The PI's Perspective. Johns Hopkins University Applied Physics Laboratory. Retrieved May 25, 2007. ↑ Elliot, J. L., M. J. Person, A. A. S. Gulbis, E. R. Adams, E. A. Kramer, C. A. Zuluaga, R. E. Pike, J. M. Pasachoff, S. P. Souza, B. A. Babcock, J. W. Gangestad, A. E. Jaskot, P. J. Francis, R. Lucas and A. S. Bosh. "The Size of Pluto's Atmosphere as Revealed by the 2006 June 12 Occultation." Division of Planetary Sciences of the American Astronomical Society meeting, October 2006. ↑ Boyle, Alan. Pluto regains its place on the fringe. MSNBC. February 11, 1999. Retrieved May 25, 2007. ↑ Buie, Mark. Pluto Questions. Lowell Observatory. Retrieved May 25, 2007. ↑ Colossal Cousin to a Comet?. New Horizons. Retrieved May 25, 2007. ↑ Tyson, Neil deGrasse (1999). Space Topics: Pluto Top Ten: Pluto is not a Planet. The Planetary Society. Retrieved May 25, 2007. ↑ Gugliotta, Guy. (November 1, 2005). Possible New Moons for Pluto. Washington Post. Retrieved May 25, 2007. ↑ 19.0 19.1 19.2 NASA's Hubble Discovers Another Moon Around Pluto. NASA (July 20, 2011). Retrieved July 20, 2011. 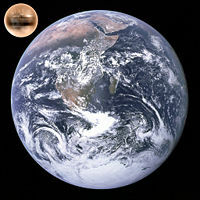 ↑ Wall, Mike, "Pluto Has a Fifth Moon, Hubble Telescope Reveals", Space.com, 11 July 2012. Retrieved July 11, 2012. ↑ Marc W. Buie, William M. Grundy, Eliot F. Young, Leslie A. Young, S. Alan Stern (2006). Orbits and photometry of Pluto's satellites: Charon, S/2005 P1, and S/2005 P2. Astronomical Journal 132 (1). ↑ Trent J. Perrotto, Ray Villard, and Karen Randall, NASA's Hubble Discovers Another Moon Around Pluto HubbleSite News Center, July 20, 2011. Retrieved April 26, 2013. ↑ IAU Circular No. 8723 - Satellites of Pluto. International Astronomical Union (June 21, 2006). Retrieved May 25, 2007. ↑ Ward, W. R. and R. M. Canup (2006). Forced Resonant Migration of Pluto's Outer Satellites by Charon. Science 313 (5790): 1107-1109. ↑ Weaver, H. A. and S. A. Stern, M. J. Mutchler, A. J. Steffl, M. W. Buie, W. J. Merline, J. R. Spencer, E. F. Young and L. A. Young (February 23, 2006). Discovery of two new satellites of Pluto. Nature 439: 943-945. ↑ 26.0 26.1 Steffl, A. J. and S. A. Stern. First Constraints on Rings in the Pluto System. ↑ NASA, Hubble Discovers a Fifth Moon Orbiting Pluto July 11, 2012. Retrieved April 26, 2013. ↑ Voyager Frequently Asked Questions. Jet Propulsion Laboratory (January 14, 2003). Retrieved May 25, 2007. ↑ Pluto Kuiper Express. NSSDC Master Catalog Display: Spacecraft. Retrieved May 25, 2007. ↑ New Horizons, Not Quite to Jupiter, Makes First Pluto Sighting. JHU/APL. November 28, 2006. Retrieved May 25, 2007. ↑ Tyson, Neil deGrasse (February 2, 2001). Astronomer Responds to Pluto-not-a-Planet Claim. Space.com. Retrieved May 25, 2007. ↑ IAU 2006 General Assembly: Result of the IAU Resolution votes. IAU (2006-08-24). Retrieved March 21, 2007. ↑ Britt, R. R. (August 24, 2006). Pluto Demoted: No Longer a Planet in Highly Controversial Definition. Space.com. Retrieved March 29, 2007. ↑ Ruibal, S. (January 6, 1999). Astronomers question if Pluto is real planet. USA Today. Retrieved May 25, 2007. ↑ Britt, R. R. (November 21, 2006). Why Planets Will Never Be Defined. Space.com. Retrieved May 25, 2007. ↑ Britt, R. R. (August 24, 2006). Scientists decide Pluto’s no longer a planet. MSNBC. Retrieved May 25, 2007. ↑ Shiga, D. (August 25, 2006). New planet definition sparks furore. NewScientist.com. Retrieved May 25, 2007. ↑ Stern, S. A. and H. F. Levison (2002). Regarding the criteria for planethood and proposed planetary classification schemes. Highlights of Astronomy 12: 205–213. ↑ Buie, Marc. My response to 2006 IAU Resolutions 5a and 6a. Retrieved May 25, 2007. ↑ DeVore, E. (September 7, 2006). Planetary Politics: Protecting Pluto. Space.com. Retrieved May 25, 2007. ↑ Sapa (October 21, 2006). Pluto's still the same Pluto. IOL.co.za. Retrieved May 25, 2007. ↑ “Plutoed” Voted 2006 Word of the Year. American Dialect Society (January 5, 2007). Retrieved May 25, 2007. Chhabra et al. “Prediction of Pluto by Ketakar.” Indian Journal of History of Science 19(1) (1984): 18–26. Henderson, M. “Pluto may lose status of planet.” New Straits Times, F17, October 30, 2005. David H. Freedman, "When is a Planet Not a Planet? ", Atlantic Monthly, February 1998. NASA's Pluto-Kuiper Belt Mission – launching in early 2006. Pluto in Science Fiction – Bibliography of science fiction which is set on Pluto. Windows to the universe – Pluto. "Two More Moons Discovered Orbiting Pluto" - Space.com. NASA's Hubble Reveals Possible New Moons Around Pluto – Hubble Press Release. Pasachoff et al., "The Structure of Pluto's Atmosphere from the 2002 August 21 Stellar Occultation," Astron. J., 129, 1718–1723. "Pluto's 3:2 Resonance with Neptune" - GravitySimulator.com. "Dwarf Planets May Finally Get Respect" - NPR article by David Kestenbaum. NPR segment discussing the linguistic and cultural aspects of Pluto's planethood. This page was last modified on 29 March 2019, at 21:54.